As part of our commitment to delivering the best service we can, we are planning some upgrades for two towers early next week. Monday 22 April, 10:00 AM to 3:00 PM. Some clients in Espanola connected to the HS tower will experience a brief outage as we swap an access point. Tuesday 23 April, 10:00AM to 3:00 PM. All clients connected to GJ in Sombrillo will experience a brief outage as we swap a routing device and convert an existing access point to a different model. 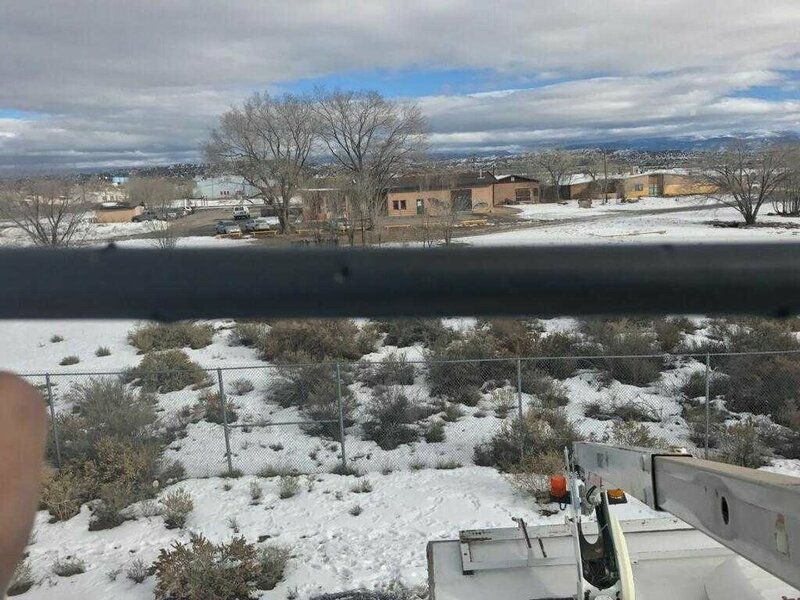 A power outage in Alcalde is affecting service to all clients connected around the Onate visitor’s center and all clients in Alcalde, Ohkay Owingeh, Hernandez, Chamita, El Gique, and the northern edge of Espanola. Some time around 02:00 on Feb 15th we were hit with a distributed denial of service attack, which completely saturated both of our connections to the outside world at 1.5Gbps aggregate traffic. We are working with our upstream providers to prevent further issues if this should happen again. Five years ago I put up our first tower in Velarde, after testing the equipment for a few months on my deck. This photo was taken as I finished setting it up. We've come a long way since then. Fewer 3am outages and more customers. At the heart of this business is my desire for something better than what the local telco had to offer. I take joy in seeing people finally able to stream movies, to video chat with their grandkids, to work from home like I was trying to do before. To all of our customers, I think about you every day. Downtime pains me emotionally. I want the best service we can afford to provide to all of you. Thank you for your ongoing business. We are doing our level best to give you fast, reliable, and affordable internet service. Power has been restored and all of REDI Net's devices are back online. Thank you for your patience! We received word that REDI Net is having power-related connectivity issues at seven locations in Espanola. We are currently operating on backup links in Espanola. All clients in Espanola are affected at this time. As we know more, we will provide further updates. Our apologies for the delayed update, the HS tower site was brought back online yesterday afternoon at around 16:30 local time. REDI Net not able to locate fiber break, emergency repair equipment has not arrived. REDI Net has not yet located the damaged portion of fiber and has not received the necessary components to resume service to our location. We are currently still operating on our reduced capacity backup link. REDI Net has not provided us with an estimated time for the repair to be completed. We are working to reinforce the backup link early this coming week. Thank you for your patience. The fiber repair crew was unable to locate the damaged equipment yesterday and they are continuing their search today. We were just notified that the upstream provider (REDI Net) outage affecting some of our customers was due to a fiber break. A fiber splicing contractor has been called by REDI Net to locate and repair the break. Normal service will be restored when they are finished finding and repairing the break. We are unable to improve performance until that is resolved. They have told us it will not be resolved until Thursday the 3rd at the earliest. Beginning at 11PM on 2018-12-27 issues with our connectivity in Espanola started happening, originally we thought related to a problem with our connections from REDI Net in that area. That may be true, but shortly after that widespread power outages began in Espanola. We are waiting for more information on what is causing these issues.